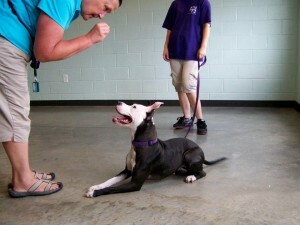 Dale Ward was the Volunteer Trainer at the Portsmouth Humane Society in Portsmouth, VA. This shelter is one of the longest-serving Humane Societies in the Commonwealth of Virginia. Portsmouth Humane Society (PHS) is dedicated to caring for homeless animals in the community by promoting their adoptions into loving, permanent homes. As a part of this mission, Dale helped establish the PACK Team (Portsmouth Association of Canine Knowledge), a group of dedicated volunteers who train shelter dogs with the goal of helping them become more adoptable. Dogs and volunteers were taught the basics of sit, polite greeting behavior, focus cues and more, all with the intent of helping the dogs handle meeting new people, attending adoption events, and finding permanent homes. Dale has also implemented Karen Pryor’s Bark Free protocol at the shelter. The “bark free” initiative is one that was developed to improve the lives of shelter dogs and reduce kennel stress. Although barking is a normal, healthy behavior in dogs, in a kennel environment it can be very stressful. Barking is not completely eliminated through this protocol. Dogs still bark at birds, noises, other dogs, etc. However, the dogs are given a free choice as to how they react when a human approaches their kennel. A sit and quiet response gets a click and a treat, and continued quiet gets another click and a treat. Each dog makes the choice to bark or not, no aversive techniques are used, EVER. The dogs love to make “clicks happen” and earn some tasty treats. There are other important benefits to this Bark Free program. The dogs are given a choice in how they respond, an important part of enrichment for them. Choice is very important to dogs. Also, they learn to love to see people coming! PHS has trained over 350 volunteers in this protocol to date. This diversity has afforded the dogs the opportunity to learn that all people, no matter what they look like: men, women, children, black, white, hats, hoods, tall, short, handicapped, glasses, etc., all kinds of people are GOOD because they bring treats. Members of the general public are very impressed by the shelter dogs who greet them politely by sitting quietly instead of jumping, lunging and barking. Want to join the PACK Team? Just send an email to [email protected] or call (757) 397-6004 to sign up!